Courtesy of Mastering the Art of French Cooking, Volume 1, Beck, Bertholle and Child. Boil down lemon juice, salt and pepper until reduced to around a tablespoon. Remove from heat and beat in two pieces of butter. 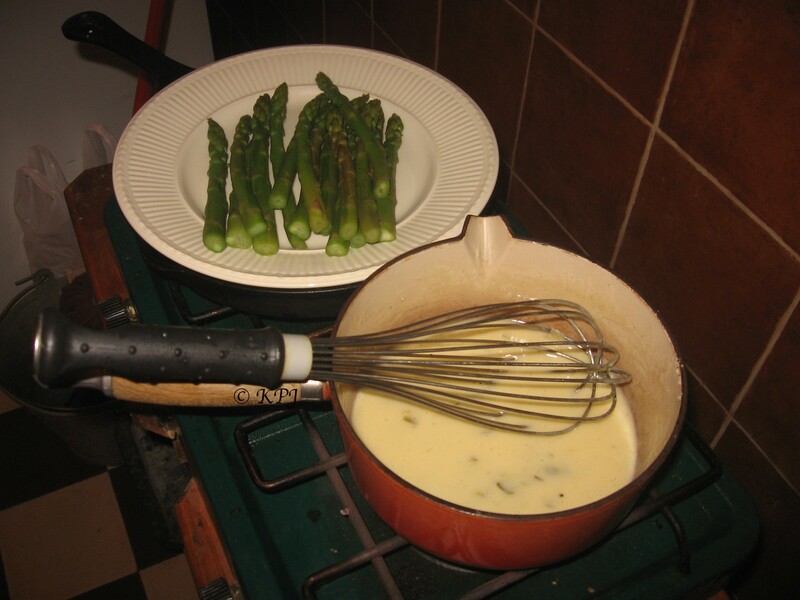 Place over very low heat and beat in the rest of the butter, a piece at a time to make a thick creamy sauce. Do not keep sticking finger it to taste it or there won’t be enough. (OK I added that bit). Immediately remove from heat. Just before serving beat in the hot liquid drop by drop to warm the sauce. Correct seasoning and serve in a barely warm sauceboat. Like anything it’s about taste, so squeeze as much lemon juice as suits you, and add proportionately, more or less, the right amount of butter. The recipe calls for a wire whisk but I tend to use a wooden spoon. Easier for tasting really. I don’t bother with a sauce boat, preferring to pour it over the veg, or whatever else it is accompanying. As usual, less is more, you don’t want to kill the other flavours, this is an enhancement not a drowning. Bon appetit.